Flickr is the ultimate place to find awesome photos. A lot of photos are uploaded on Flikr everyday. It boasts about 6 billion photos, and the numbers are increasing day by day! So what do you do if you want some high quality photo for a project, article or website, or simply want to see some beautiful photos when you are bored? Search for them, simple! 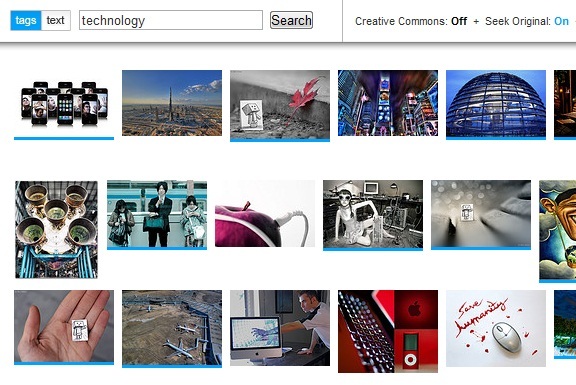 So here are 5 Powerful Search Engines To Find Photos On Flickr . Check them out! Compfight is a very handy website that lets you find photos quickly and easily. All you have to do is to type in your search query and then choose if you want to search for that word in the tags of photos or their text descriptions. You also have to choice of searching throught the Creative Commons images, which can prove to be significant if you are searching for an image for a project. Thumbnails will be displayed after you have searched and then you can click on the thumbnail to open up its corresponding Flickr page. Tag Galaxy is an amazingly cool website. Simply type in your tag on the homepage and then click Go. After you have clicked go you will be directed to a search page displaying what appear to be planets. Then you can click on different planets in order to drill down your search to a specific tag. For instance, you searched for ‘technology’ and planets named ‘computer’, ‘phone’, ‘laptop’, and ‘ipod’ are displayed. Simply clicking on the planet you want takes you to a 3D spherical image showning all of the images related to that tag. What is even more cool is the fact that you can spin the sphere by dragging it and then you can click on individual photos to see them zoomed in. Awesome! 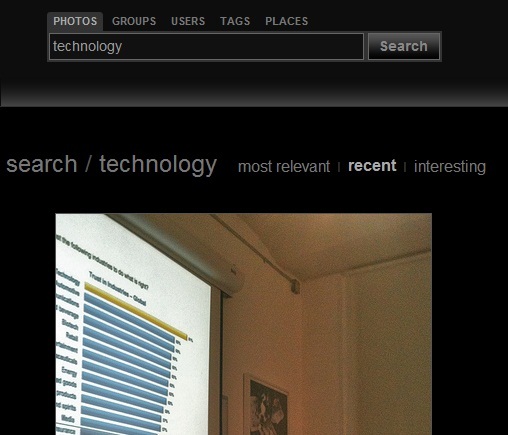 This one is a very easy to use Flickr search engine. It gives you the ability of searching photos, groups, users, tags, and even places, and photos show up vertically on the page according to relevance, most recent, or most interesting. You also have the choice of setting the size at which photos are displayed on the page. PictureSandbox is not very pretty but still is very effective. All you have to do is to simply type in your search on the homepage and click the Submit button to see photos on not only Flickr, but Stockxpert, Fotolia, Dreamstime, SmugMug, and Webshots tool. If you can’t find an image on this site, then most probably it does not exist. 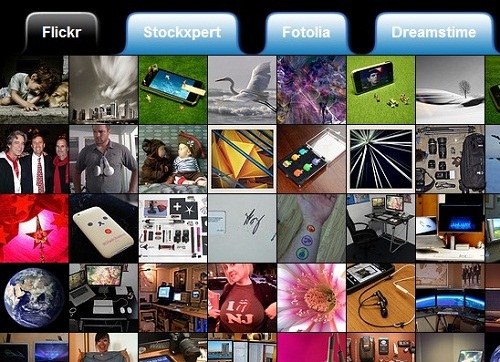 FlickrStorm is a very handy and minimalistic photo search site. Just type in your search query and start the search. An “advanced” link is also present that you can click if you want to search for Creative Commons photos that you are allowed to use commercially. This website also lets you view your history of the photos that you have clicked on, and a tray too that you can add photos to and download them from. 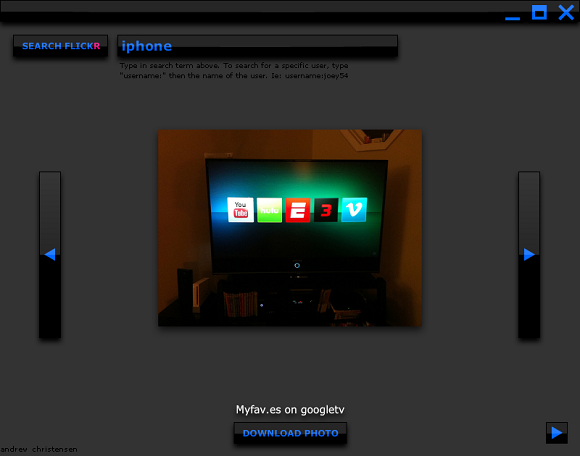 Adobe’s Flickr Flipper app is a must mention here. This app runs on Adobe Air and is very minimalistic. If you want to flip through random Flickr photos when you are bored or when you don’t know what you are looking for, then you should definitely try using Flickr Flipper. What is your favorite website when searching for Flickr photos?